Scanning electron microscopy is a great way to obtain information about a sample’s surface topography and composition in industries such as microelectronics, semiconductor, medical devices, general manufacturing, insurance and litigation support, R&D, and food processing. Magnification for all imaging is calibrated to a traceable standard. Image analysis for coating thicknesses, grain size determinations and particle sizing can be applied to the saved images. Qualitative elemental analysis, standardless quantitative analysis, x-ray line scans and mapping can be performed on both of the SEM systems. Contact our experienced analysts to discuss your individual scanning electron microscopy needs. For more information, read more below about how SEM/EDS works and the three different types of systems. SEM is a method for high resolution surface imaging. The SEM uses electrons for imaging, much as light microscopy uses visible light. The advantages of SEM over light microscopy include greater magnification (up to 100,000X) and much greater depth of field. Different elements and surface topography emit different amounts of electrons; the varying amount of electrons are responsible for the contrast in the electron micrograph (picture) which is representative of surface topography and composition. Energy dispersive spectroscopy (EDS) measures the number of x-rays produced by a solid sample when irradiated by electrons versus the energy of these x-rays. The EDS technique identifies and quantifies the element constituents of the sample. This type of analysis uses a high vacuum chamber with a tungsten filament to give moderate magnifications of around 20,000X. This type of analysis is typically used for examination of mechanism and material anomalies in conductive materials. Fine fracture features and non-conductive materials can be examined with coating. 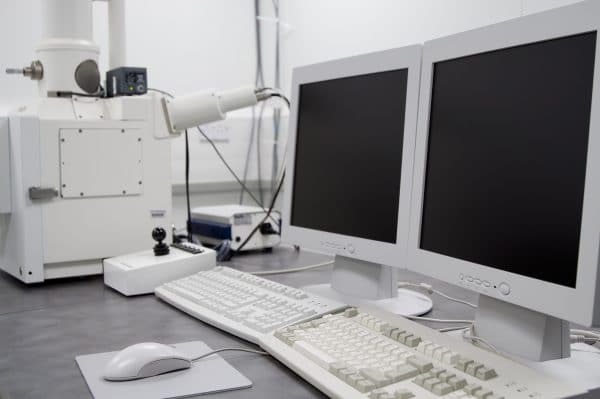 The variable pressure SEM (VPSEM) is a relative newcomer to the world of scanning electron microscopy, but has become a workhorse instrument in many analytical laboratories. By varying the pressure in the vacuum chamber, these instruments can operate at moderately high magnification (50,000X on conductive samples or at lower magnification nonconductive or wet samples. Before VPSEM, nonconductive samples had to be coated prior to SEM examination, and it was not possible to image wet samples at all. The ability to image nonconductive samples without coating is a great advantage for nondestructive evaluation and for performing microanalysis without the distraction of carbon or metal coating. The VPSEM also has a spacious sample chamber that can accommodate large and irregularly-shaped specimens. With a brighter electron source and smaller beam size than the VPSEM, the field emission scanning electron microscopy (FESEM) increases the useful magnification range for observation and imaging up to 500,000X. A second advantage of FESEM is that high resolution imaging can be performed with very low accelerating voltages. At low voltage, very fine features are more readily observed, especially for low-density materials. Low voltage SEM examination is ideal for imaging polymer materials and thin films. You are always welcome to contact our experienced analysts to discuss your specific analytics needs.